New York City plays host to a flock of celebrities, models and designers each time Fashion Week rolls around. And this Fashion Week was no different, with model and actress Emily Ratajkowski stopping by the festivities to host her own star-studded event on Sept. 10 at Soho House in New York City to celebrate her edition of harper by Harper’s Bazaar with the magazine’s executive editor Laura Brown. Ratajkowski attended the party in what Harper’s Bazaar reports is are Calvin Klein Collection separates — a white crop top and high-waisted wide-legged trousers. She styled her sleek look with straight hair and soft, natural makeup. Ratajkowski’s white-hot crop top ensemble is the definition of chic, but if you love this look, you’ll be disappointed to know that the exact Calvin Klein Collection separates remain elusive online. However, other crop tops and pants in the Fall 2015 collection retail anywhere from $850 to $1,150 and from $1,995 to $2,495 respectively. Just because the exact pieces cannot be located doesn’t mean you still can’t recreate her look for yourself, and that’s where we come in — we’ve found all the pieces necessary to recreate Ratajkowski’s entire look for less than even one piece from Calvin Klein Collection. First on our shopping list was a strapless crop top worthy enough to be included in our look-alike ensemble, and we found it in the form of the Missguided V Insert Bustier Top from Asos. This top adds an extra detail with its notched hemline, which will bare a bit more of your midsection while still falling at the natural waist to define your shape. For only $44.79, this top will make an affordable foundation from which to build the rest of our look for less. The Missguided V Insert Bustier Top, found on Asos.com. High-waisted wide-legged trousers will complete our reimagined look, and there’s no better pair for the job than the Premium Crepe Wide Leg Trousers from Missguided. 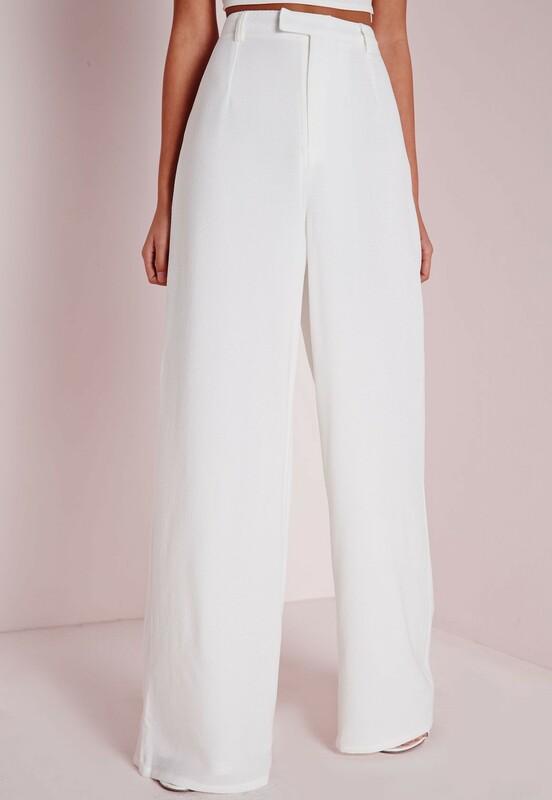 Done in the same wide-legged, high-waisted silhouette, these pants will not only meet the hemline of your crop top to create a defined waist, the legs of the pant will also fall straight from your hips to the floor, creating an elongated, lean shape. These trousers will finish off your look for an easy $60. The Premium Crepe Wide Leg Trousers, found on Missguidedus.com. Emily Ratajkowski’s all-white Harper’s Bazaar party ensemble may have an elusive price tag, but we’re sure our look-alike outfit is definitely less, coming it at $104.79. Pair your look with a sky-high heel and let your hair fall in a soft, straight style and you’ll have effortlessly recreated Ratajkowski’s look. Women of all ages obsess over the lines, marks and spots they sport on their bodies. And as if we don’t already do that enough, photo-editing and retouching creates false images of flawlessness that serve to make us feel that our marks are something to be ashamed of. But in a recent video from Buzzfeed Yellow, women are finding the meaning in their marks, specifically their stretch marks. According to The Huffington Post, the video depicts women candidly discussing the first time they noticed their stretch marks (some discovered theirs in high school), as well as their genuine feelings about them. In sharing this, they also recount how they’ve come to love their marks. One shared that her stretch marks served as a reminder of her strength, while another explained that she’s come to love her marks simply because they’re a part of her. “It shows me that I’ve grown up, and they make me feel kind of special,” she said. Thank you to Buzzfeed Yellow and their participants for showing us that our imperfections are what makes us beautiful, strong women. New York Fashion Week is known as a showcase of high fashion designs courtesy of the world’s top designers. And while these designers have garnered much attention for their couture looks, there are other, more accessible designers who have attracted just as much, if not more, attention. Enter Lauren Conrad, who participated in Fashion Week for the first time ever with her LC Lauren Conrad Runway Collection. All of the designs she debuted at her runway show are available at Kohl’s, making her line one of the most accessible and affordable collection to hit the runway this season. Looking as stylish as ever, Conrad attended her show in an ensemble of her own designs, wearing a scalloped lace crop top paired with high-waisted wide leg trousers. Conrad’s effortless-chic look speaks to the overall quality and aesthetic of her Kohl’s collection, making us want to drop everything and hit up our nearest Kohl’s to take her look for ourselves! And if this look makes you want to do the same, we’ve hunted down the exact pieces Conrad is wearing so you can take her exact New York Fashion Week look for your own. Looking lovely in lace, Conrad’s Fashion Week look begins with her LC Lauren Conrad Runway Collection Scallop Lace Crop Top in natural. This top features a delicate, intricate lace with a scalloped detail not only on the sleeves, but also on the hemline. The shirt’s hemline hits right at the natural waist, allowing the straight-cut top to still define your waist and create shape. For only $45, you can get Conrad’s Fashion Week look on sale from its $60 regular price. The LC Lauren Conrad Collection Scallop Lace Crop Top, found on Kohls.com. The LC Lauren Conrad Runway Collection High Waist Wide-Leg Pants complete the look, adding a modern flare that contrasts the classic elegance of the lace. The waist of these pants meet the hemline of the crop top, further defining your waist, while the legs of the pants fall straight down from the widest part of the hip; these two features combine to create the illusion of a long, tall, lean silhouette. These pants complete her look for a sale price of only $51. The LC Lauren Conrad Runway Collection High Waist Wide-Leg Pants, found on Kohls.com. Lauren Conrad’s first-ever New York Fashion Week runway show seemed to be a complete success, and her crop top/wide-legged pant duo was certainly a success in our book! If you love her look, you’ll be thrilled to know that the separates only cost a combined $96 — now you can take a Fashion Week look as your own for under $100. Jessica Alba has enjoyed tremendous success not only as an actress, but also as a business woman, especially with the recent prosperity of her company, The Honest Company. And her success with her ‘Honest’ products is about to grow with the Sept. 9 launch of her Honest Beauty Skincare and Makeup line. According to The Daily Mail, Alba celebrated the launch of the line with a party at the Trump Soho Hotel in New York City, and she was the image of an ‘honest’ beauty. Wearing what InStyle reports was a Jonathan Saunders geometric-patterned lace overlay dress, Alba was a vision in a soft blush with a touch of bright pink at her feet, sporting suede pointed toe pumps in the eye-catching hue. Alba’s Jonathan Saunders dress makes us blush with envy, but if you want this dress as much as we do, it may not be as accessible as it appears. The Daily Mail says that this dress is part of Jonathan Saunders’ Resort 2016 collection, making it currently unavailable to the public. However, even when this dress hits stores, its price may be a deterrent, as other Jonathan Saunders dresses start on Net-a-Porter for a lofty $1,085. But if you are neither willing to wait for the real deal nor willing to shell out upwards of $1,000 for this sweet style, we’ve found all the pieces necessary to recreate Alba’s entire look for less. Read on for the results. Finding a lace style to rival the Jonathan Saunders frock was no easy task, but we thought the Guess Lace Illusion Sheath Dress from Lord and Taylor was a good alternative to Alba’s pricey dress. Done in a similar midi style, this dress offers both a sweet lace and see-through sleeves and hemline reminiscent of Alba’s dress. Available for $168, this dress will easily pass Alba’s Jonathan Saunders look for a fraction of the cost. 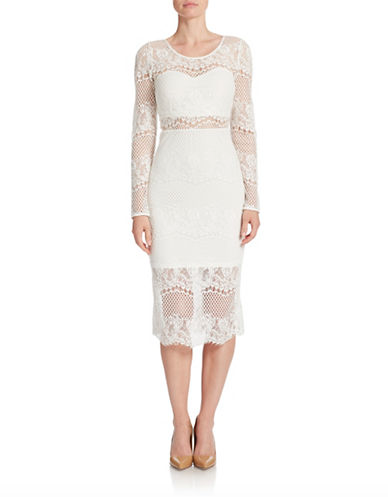 The Guess Lace Illusion Sheath Dress, found on LordandTaylor.com. Capping off our look for less is a pretty pink pump, and there is no better style than the Jessica Simpson Sandous Platform Pump to do the job. 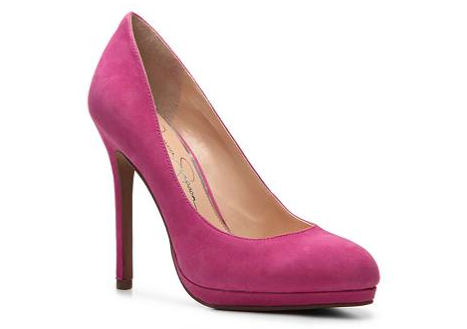 Featuring a pretty fuchsia suede outer, these pumps will inject a much-needed shot of color to your look-alike ensemble — and the best part is their on sale for only $44.94 from DSW. The Jessica Simpson Sandous Platform Pump, found on DSW.com. If you love Jessica Alba’s beautiful look but aren’t willing to wait for the Jonathan Saunders Spring 2016 collection or pay a high price for the ensemble, we’ve recreated Alba’s look from head to toe for only $212.94. Complete your look with a touch of Alba’s new Honest makeup, and you’ll be ‘honestly’ stunning! Fashion week is officially upon New York City, and while this usually means dozens of runway shows featuring looks from the industry’s top designers, one designer, is making her unique models the star of her New York Fashion Week appearance. According to the New York Daily News, designer Carrie Hammer is putting on her fourth “Role Models Not Runway Models” show at Fashion Week; as its name indicates, the show doesn’t use traditional runway models to showcase her designs. Instead, Hammer features ” female CEOs, an Olympian, activists and entrepreneurs in order to change the face — and figure — of beauty,” says the Daily News. After searching for models for her first runway show two years ago for her “office couture line,” Hammer realized that the industry’s standard models didn’t align with her brand’s “power-woman image.” So the Daily News says she reached out to clients and others in her network and ended up enlisting the help of Danielle Sheypuk, a psychologist. In modeling Hammer’s designs in February 2014, Sheypuk became the first model in a wheelchair on the runway of a New York Fashion Week. Hammer received many emails thanking her for featuring Sheypuk in her fashion show, including one from Kate Driscoll, who according to the Daily News is a mom of six and the founder of Changing the Face of Beauty, an organization that “encourages the media to fairly represent people with disabilities.” Driscoll requested that Hammer feature a model with Down syndrome in her next show, and Hammer heeded her request by asking Jamie Brewer of “American Horror Story” fame to model for her line last February. Thank you, Carrie Hammer, for teaching us that we can rise to be whatever we desire to be, and that powerful, inspiring women are beautiful women. At the Royal Opera House on September 8, the most dapper men took to the red carpet outside of the London, England venue for the GQ Men of Style Awards. Dozens of actors, musicians and famous men of today arrived as polished as ever, but while the night may have been about them, there were a certain few ladies in attendance that may have stolen the show. One of those eye-catching looks came courtesy of Naomie Harris, who posed on the red carpet in a soft yellow mesh dress covered with intricate embellishments. InStyle reports that the actress finished off her look with a black and gold clutch along with metallic sandals by Tamara Mellon. Harris’ yellow ensemble was followed up by an orange number donned by “Game of Thrones” actress Emilia Clarke. Wearing a tiered, flared and embellished orange frock, Clarke made a statement in her minidress, pairing it with dainty silver bangles and what InStyle says are ankle-strap pumps by Jimmy Choo. Although Harris and Clarke are styled for a red carpet event, there are certain things from their looks that we can apply to our everyday style. Cap sleeves cap it off – Naomie Harris’ dress show us just how powerful a cap sleeve can be in a garment. In her dress, the cap sleeve serves to accentuate her shoulders, making them look a bit broader than they appear. This illusion is not only created by the cap sleeve itself, but also by the embellishment on the sleeve, which draws more attention to the shoulder area. Having your shoulders emphasized in this way creates balance between the top half of your body and the lower half of your body, making your shoulders and hips seem perfectly proportional while also creating an hourglass silhouette. The next time you are shopping for a dress or even a top, keep in mind that something as simple as a cap sleeve can work wonders in creating the illusion of balanced, proportionate shape. Define your waist while wearing a dropped-waist – While dropped-waist dresses can often have the effect of making your legs look shorter, this effect can be reversed when the natural waistline is defined. Emilia Clarke’s orange frock perfectly demonstrates how these double defining seams operate within the garment: the seam at her natural waist fits closer to the body and not only makes her waistline look tiny, but also makes it appear as though her legs begin at that point. The second seam, then, serves to accentuate the top of her hips and complete the hourglass shape she started with her dress’ straight neckline and defined waistline. From this point, the skirt flares out to create an almost A-line silhouette. If you are considering a dropped-waist dress for a special occasion you will be attending, define your natural waistline (if possible) to ensure that your legs look longer while also accentuating your natural curves. Standing in the middle of market wearing nothing but a blindfold and a bikini sounds like the stuff of every woman’s worst nightmare. But in reality, it proved to be quite the opposite for one Idaho woman. Inspired by a project from an Australian group known as The Liberators International, Buzzfeed reports that Idaho-native Amy Pence-Brown decided to bare it all for the sake of self-love. Pence-Brown, the founder of the Boise Rad Fat Collective, a group she describes as “socially engaged Idahoans of all shapes and sizes who are fed up with mainstream media and society telling us what a valuable body should do\be\act\look like,” decided to stand in the middle of a market in Boise in a bathing suit and a blindfold, asking passersby to draw a heart on her body to promote self-love. Pence-Brown shared the aim of her experiment with Buzzfeed, explaining that she hoped to inspire people make peace with their bodies, something she said she learned to do years ago. Thank you, Amy Pence-Brown, for so boldly and fearlessly teaching us to love ourselves and be at peace with who we are. You are truly an inspiration to us all. To watch the video and read more about her experience, click here. Scroll through your Instagram feed any day, and you’re bound to see at least one makeup-free selfie, if not from one of your friends, then from a celebrity. And the latest celebrity to add her own makeup-free selfie to the social media site was Julia Roberts. Her statement about beauty standards continued, with Yahoo reporting that she asked her followers, “How can you expect someone else to love you if you don’t love yourself?” Therefore, Roberts explained that we have to be happy with ourselves, saying that who we are on the inside trumps our outward appearance. Thank you, Julia Roberts, for teaching us not only to see the beauty in others, but to see the beauty within ourselves. With every film festival comes tremendous red carpet style, and this certainly held true for the 72nd Annual Venice Film Festival. The festival is days away from its September 12 conclusion, but there is one look that make us wish it would never end. This covetable look comes courtesy of Diane Kruger, who attended the festival in a red jumpsuit with a V-neckline intersected by a band at the bust that InStyle reports is by Cushnie et Ochs. She completed her look with black sandals and a gold clutch designed by Lee Savage. Kruger’s spicy jumpsuit, the Stretch Cady Jumpsuit by Cushnie et Ochs, delivers a structured silhouette in a bright scarlet red, but if you love this jumpsuit, you’ll have to shell out a whopping $1,695. Her luxurious look doesn’t stop there, incorporating the Gold Plane Space Clutch by Lee Savange that costs $2,595. Her film festival ensemble might cost upwards of $4,290, but we’ve found all the pieces necessary to recreate her entire look for less than $200. Read on for the results! Finding a jumpsuit to rival Kruger’s Cushnie et Ochs style was no easy task, but we thought that the ASOS Jumpsuit in Sculpt Me Bodyfit came pretty close. Done in an equally eye-catching red, this jumpsuit also delivers a cutout at the neckline reminiscent of Kruger’s look. While this jumpsuit is fairly similar to Kruger’s, it’s certainly not similar in its price, coming in at only $71.66. The ASOS Jumpsuit In Sculpt Me Bodyfit, found on Asos.com. Our look-alike red jumpsuit could use a little bit of shine, and that’s where the SASHA Metallic Embossed Box Clutch from Lord and Taylor comes in. This clutch offers a similar gold tone in a box silhouette, which calls to mind the architectural style of Kruger’s Lee Savage clutch. This handbag is sure to add some shine to your look for only $48. 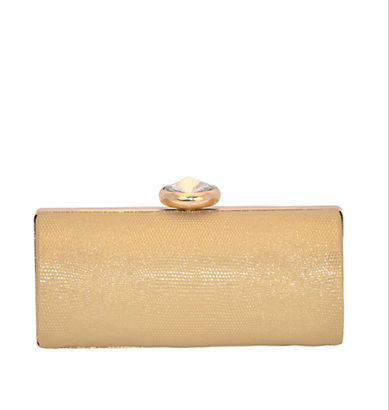 The SASHA Metallic Embossed Box Clutch, found on LordandTaylor.com. 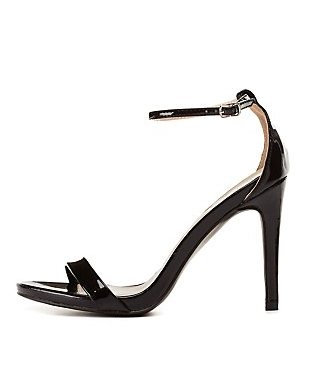 Our look for less wouldn’t be complete without a simple black sandal, and the Qupid Single Sole Ankle Strap Heels from Charlotte Russe will do just that. Available for only $32.99, these heels will take your look to the next level without breaking the bank. The Qupid Single Sole Ankle Strap Heels, found on CharlotteRusse.com. Wearing white after Labor Day is one of the most well-known fashion faux-pas — and myths. But in case that is an actual rule of style etiquette, Elle Fanning got in her last white ensemble of summer just before the holiday. On September 2, Fanning was spotted at Los Angeles International Airport wearing a white lace-embellished chiffon dress, which she paired with what InStyle reports are Simon Muller x Mascot sunglasses. She completed her on-the-go look with light pink ankle booties and a Louis Vuitton crossbody bag. While Fanning’s entire outfit is the object of our envy, we can’t help but zero in on her luxurious Louis Vuitton purse, the Speedy Bandoulier 30 bag. It’s not shocking, however, that this covetable crossbody comes at a very high price — a $1,390 price, to be exact. But if you love Fanning’s entire ensemble, we found all the pieces necessary to recreate her look for less, much less than the cost of her crossbody. Read on for the results! First on our shopping list was a lace-embellished chiffon dress to mimic Fanning’s frock, and we found the perfect alternative in the form of the Jessica Simpson 3/4 Sleeve Chiffon Dress from Zappos. Delivering a similar floating silhouette and lace details, this dress will surely pass for Fanning’s, but will only set you back $128. The Jessica Simpson 3/4 Sleeve Chiffon Dress, found on Zappos.com. Finding light pink ankle boots to pair with our look-alike dress was like searching for a needle in a haystack, but we finally landed on the Seychelles Lucky Penny Booties from 6pm. While the color is subtle, they will certainly add a bit of dimension to the soft look for $89.99. 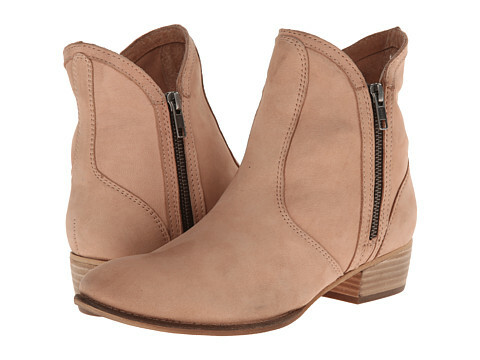 The Seychelles Lucky Penny Booties, found on 6pm.com. 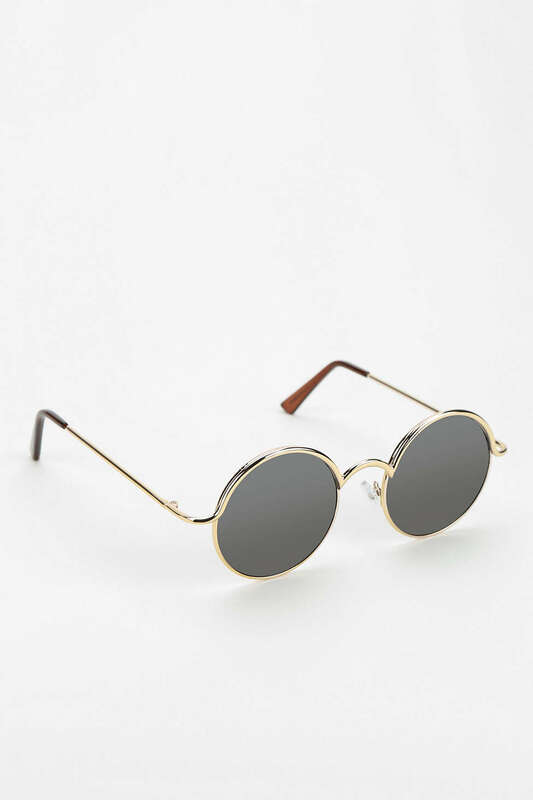 Circular sunnies will add a whole new level of cool to your look, and the Follow the Lines Round Sunglasses from Urban Outfitters will do just that. These glasses will fool all your friends into thinking that they are much more expensive than their $15 price tag. The Follow the Lines Circular Sunglasses, found on UrbanOutfitters.com. Our look for less wouldn’t be complete without a bag to rival Fanning’s Louis Vuitton look. While nothing compares to a genuine Louis Vuitton design, this Barrel Body Satchel by Dasein delivers a comparable style at a fraction of the cost. Done in a rich tan, this satchel will be your new go-to bag for all of your favorite outfits. Its similar barrel construction comes in a close second to its first best feature, that being its $47.99 price. 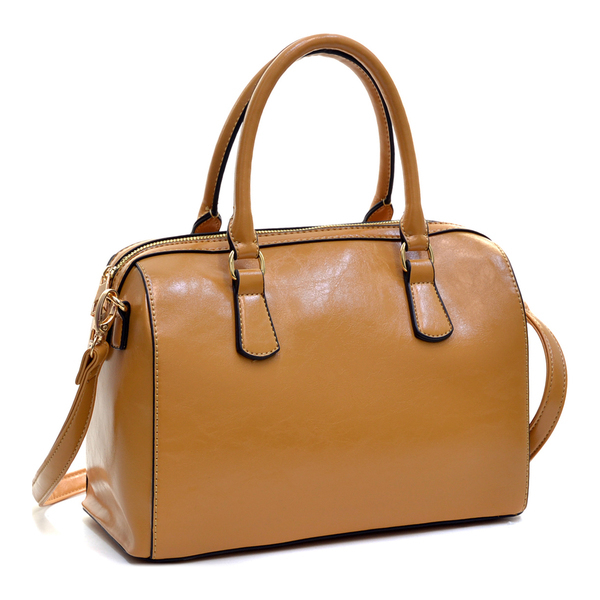 The Dasein Barrel Removable Shoulder Strap Body Satchel, found on Overstock.com. Elle Fanning’s fashionable ensemble may have cost upwards of $1,390, but our recreated ensemble will give you a similar look from head to toe for a total price $280.98. Now you can look like a star without spending like a star!